We thought we would revisit some old promotional films in the future. Promotional films put a great face on Boxwell, but the film itself doesn’t always stand the test of time. Color film in particular doesn’t always do so well. Nevertheless, this week we’re looking at what we believe is probably the first promotional film of the Old Hickory Boxwell. The film was professionally done and gives a really superb view of camp in the mid-1960s. 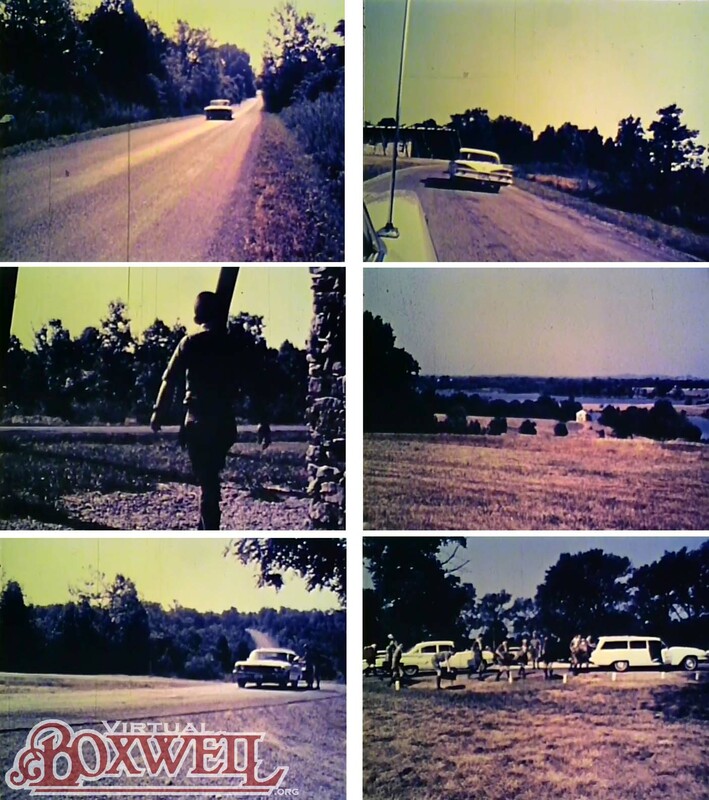 We’ve picked several frames to show you how Boxwell looked in earlier days! Top Row, left: This is the view coming into camp. Today, you woudl recognize this stretch of road by the Grizzard Gateway on the right. Top Row, right: Approaching the Cripple Crab. Middle Row, left: Staff Member leaves the Crab to greet arriving Scouts. Yes, this is the Crab. Middle Row, right: Looking down the hill toward the Pump House with Explorer Island in the background. Essentially behind the trees at the amphitheatre. Bottom Row, left: From Stahlman parking lot, looking back up the road into camp. Road to kitchen on the left. Bottom Row, right: Unloading gear at the site stakes at Stahlman; same location as today. Some frames from the the ca. 1967 Promotional film.